I have a loaner 2018 Mac Mini, while I wait for my system to arrive. So, to test it, I thought I’d edit my weekly webinar to see how well it works. 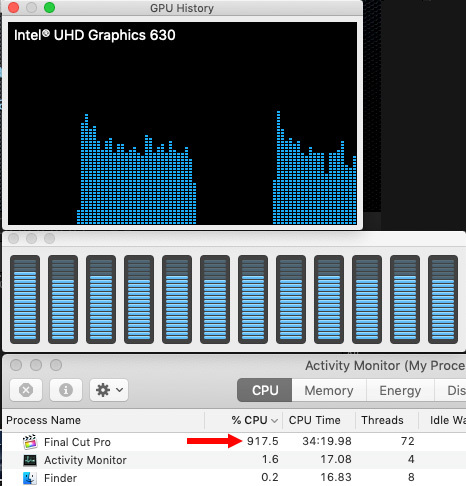 I’ve read published reports on editing using Premiere, so, for this article, I’m using Final Cut Pro X 10.4.4 (Apple’s newest version) to see what it’s like to edit on Apple’s latest computer. Here’s the configuration of the computer. It took me about 90 minutes, once the computer was unpacked and connected, to update macOS and install key applications. As I mentioned in my earlier write-up on how to configure a Mac mini for video editing, macOS and my apps take less than 40 GB, so there’s no reason to splurge for the maximum capacity in SSD storage, because most projects and media will be stored on external devices. Although it is not listed in the screen shot above, this unit also had a 1 Gb Ethernet port. NOTE: Price as tested: $2,099 (US). My recommended system uses less storage, which brings the price to $1,499 (US). Yes, the internal drive is FAST!, but it’s also expensive. There’s nothing wrong with storing media on the internal drive, it just doesn’t hold a lot. Instead, use the internal drive for the OS, applications and temporary work files. Store media and libraries on external storage. You’ve seen all those lovely images of the Mac mini in a pristine editing environment. I’m not sure where those rooms are located, but here’s what it looks like in one of my edit bays. The new Mac mini is essentially the same size as the old 2012 version. (In fact, the new model is sitting on top of the old model. I, um, didn’t have any extra room.) Even the ports, power cord and power switch are, essentially, in the same location. So the new unit will fit right in, without needing to reconfigure your desk. NOTE: As I was setting up this new system, I was struck by how much I customize my system. I suspect I’m no different from any other editor. I have favorite apps, preferences, screen layouts, even how the scroll wheel on the mouse should move; to say nothing of custom text and effects templates. I’m not complaining, but, you need to allow time during setup to not only install the apps you need but customize the system until you are comfortable working with it. It’s like breaking in a new pair of shoes – it takes a bit of squirming until everything feels “right” again. In fact, it is a good idea, especially if you’ve been editing on a different system for a while, to put together a list of all the custom Motion templates, fonts and 3rd-party software you use regularly, so you can get everything installed all at one time. Of course, I didn’t do this – so I needed to make multiple trips to my main editing system to copy files and templates. 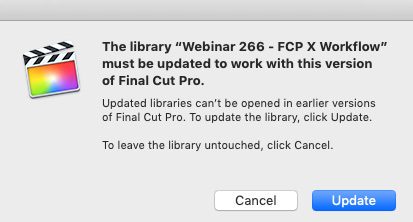 I was surprised at how many tools I use that don’t ship with FCP X itself. To get started, let’s see just how fast this system is. When it comes to performance, each of us has a different – and perfectly valid – definition. Performance is always a trade-off between your budget, your time and your projects. What works for one person won’t work for you. Here are two performance tests of a brand new (i.e. empty) Mac mini. While the numbers don’t match, frankly, I’m not worried about it. 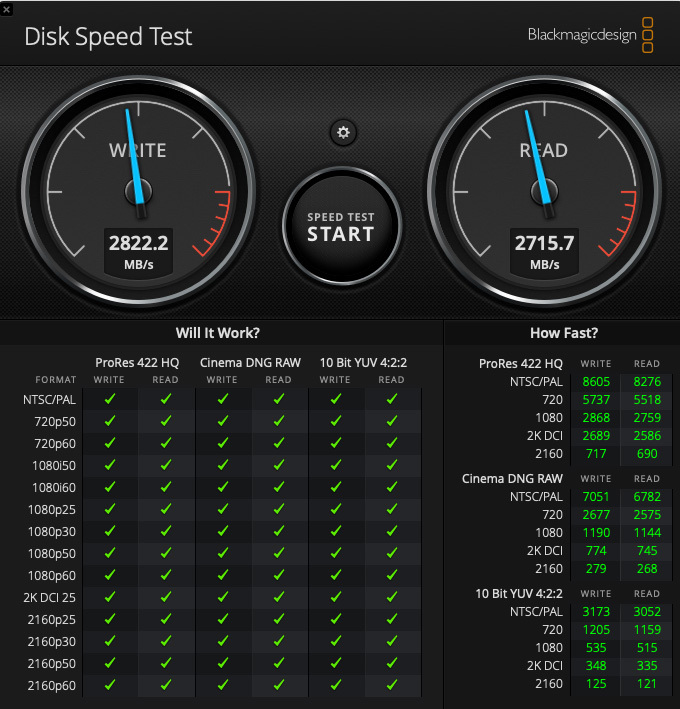 Both these tests show that the computer and its internal storage are blistering fast, supporting virtually every video format with speed to spare. NOTE: Extrapolating from these numbers, the new Mac mini should easily edit 4K video, though it may struggle with 4K RAW files. The biggest knock against the Mac mini is the GPU, which, if you remember the earlier versions from years ago, was also a concern back then. What a faster GPU gets you is faster performance. The image quality is the same, it’s simply the speed with which those images are rendered or exported that differs. The GPU in the new Mac mini can’t be upgraded internally, but you can add an external GPU to speed rendering. Blackmagic Design and OWC both supply external GPUs. I did not test this with an external GPU, I wanted to see what this specific system could do. NOTE: Here’s an article reviewing the Blackmagic Design eGPU. However, and this is important to understand, measuring total system speed is, most of the time, not useful. What’s more important is what the system is like doing real work. For example, while the internal SSD transfers data around 2 GB/second, most editing requires less than one-tenth of that bandwidth. Specs alone are not enough to make a decision. Let’s see what this system is like when we start doing real work. Record the live session using Telestream Screenflow as Apple ProRes 4444 which exactly matches the colors and images on the screen for the edit. For this article, I’m just focusing on the editing portion. Wow! This thing is FAST! I’m used to editing on a top of the line 2014 27″ iMac with a Fusion drive. The Mac mini blows the doors off my older system. Loading an 87 GB ProRes 4444 file was, essentially instantaneous. Editing to the timeline – instant. Skimming? Faster than I can drag a mouse. I can’t blame the computer any more – any delays are now my fault. CPU and storage tasks are VERY fast. GPU-based tasks, not so much. As you can see, all cores are busy and the GPU is hustling, though none are at 100%; again, there is system overhead that prevents any single component from running at 100% all the time. While you can get faster effects performance, most of the time, from an iMac Pro, the Mac mini is more than adequate for normal editing and effects; especially for HD media. The Mac mini speakers are inadequate for editing. You’ll either need to use headsets or external speakers. My preference, for mixing, is to always use speakers; they are more representative of the average video viewing environment. Scaling the timeline, changing the size of clip display and other interface operations are, essentially, instantaneous. Let me get back to editing, and I’ll report back in a bit. As I’m editing and trimming, the CPU is barely breaking a sweat, the GPU is taking a nap and the storage is delivering media at a consistent 30-40 MB/second rate. After an hour, the computer, itself, is barely warm to the touch. In other words, I’m not waiting on the computer, it’s waiting on me. This is a good reminder, as I mentioned at the beginning, to put together a list of all the custom tools and 3rd-party software you work with so that you can get everything installed at once. Hmm… I should follow my own advice. I’ve been editing my one-hour program for 45 minutes and I don’t find myself waiting on the system at all. Granted, editing uses the CPU, while effects use the GPU, but the Mac mini gives me the feeling that I’m editing as fast or faster than on my main editing iMac. If you are someone who needs speed on a budget, and doesn’t create a lot of effects, the Mac mini is impressing me. Or, if you DO create a lot of effects, but can allow a little extra time for rendering to finish, the Mac mini will save you money over a faster system. As you can see, these five clips required 118 MB/second of data transfer, while the timeline played smoothly with no dropped frames. Unrendered. I’m no longer worried about whether the Mac mini is fast enough to edit most video. It is. NOTE: Keep in mind this is an upgraded system using the faster, 6-core i7 CPU. Final Cut Pro X is optimized for Apple hardware. Premiere is not optimized to the same extent, yet. I spoke with Premiere’s product managers last week who told me that tweaking Premiere to more aggressively take advantage of Mac hardware is on their short-term roadmap. Based on what I’ve seen here, I expect that editing performance on a Mac mini with Adobe Premiere will be about the same as Final Cut Pro X, however, render and export times will be longer. I would expect similar results for After Effects. If your principle goal for a computer is editing, the Mac mini is an excellent choice. If you are principally creating effects on a deadline – for example, using After Effects, which emphasizes the GPU – an iMac or iMac Pro with a better GPU would be a better choice. NOT because the Mac mini creates poorer-looking images, simply that the render times will be longer. As always, it’s a balance between what you need vs. what you can afford. In most cases, video compression is CPU-based. While I have not tested this yet, I would expect the new Mac mini to be an excellent video compression system. Apple mentions that you can gang multiple Mac minis together to create a video compression “farm.” While this is a true statement, my experience over the last ten years shows that this feature fails as much as it works. As well, the best way to use a multi-computer network is when your media is stored on a server and consists of multiple movies. Using multiple computers to compress a single long movie into either H.264 or HEVC will not yield particularly faster performance; though using multiple computers to create ProRes files works much more efficiently. NOTE: Other codecs, including AVC-Intra, can also be segmented and distributed. And, while a single H.264 or HEVC file cannot be segmented and distributed across multiple systems, multiple H.264 or HEVC can be sent to multiple systems in a cluster for simultaneous encoding. My network uses 1 Gb Ethernet, which means that I can expect a maximum data transfer rate of about 128 MB/second. While 10 Gb Ethernet would give me ten times the speed, in order to take advantage of it, I would need to upgrade my server, replace my data switch, and re-cable my edit suites with upgraded Cat 6 Ethernet cabling. Um, not today. For new setups, 10 Gb Ethernet is the way to go. For existing edit rooms, simply adding a high-speed port on the back of the Mac mini won’t make any difference in your network speed. I’m DELIGHTED Apple added this port, but it will take me a while to take advantage of it. NOTE: It is worth mentioning the benefit of using 10Gb Ethernet for fast transfer of files from a server location to the computer for encoding. This also makes for a simple setup using the Shared Computers feature in Compressor. The new Mac mini is very impressive for editing. The speed of its internal storage is breath-taking, the 6-core CPU has plenty of pep and the overall operation for editing is very smooth. Still, I’m not going to be trading in my 27″ iMac for a new Mac mini, yet. I like the iMac because of its screen quality and its faster GPU. If I’m doing effects-heavy color grading or compositing on a deadline, the Mac mini is not my first choice. Yes, I wish the Mac mini had the option to get a faster GPU. And, the Mac mini requires that you purchase a monitor, keyboard and mouse separately; items which are bundled with the purchase of an iMac. For new users, that raises the purchase price of a Mac mini. But, even so, there are many things I plan to use this Mac mini for. Basic editing with limited effects. Every year, my podcast covers the NAB trade show using both audio and video. This next year, I’ll switch from using iMacs to Mac minis. The faster CPUs plus the 10 Gb Ethernet means that I can get more work done in less time than using iMacs. 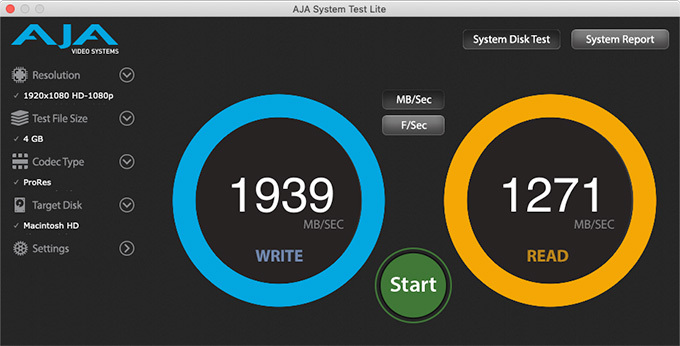 Since our NAB editing is simple and speed is of the essence, the Mac mini wins. Second edit station. When you get swamped, this is a great system to have on stand-by when you need extra help. Audio mixing. Audio is CPU-based, not GPU-based. When connected into my audio system, this will be a better audio mixer than an iMac. Stand-alone server. 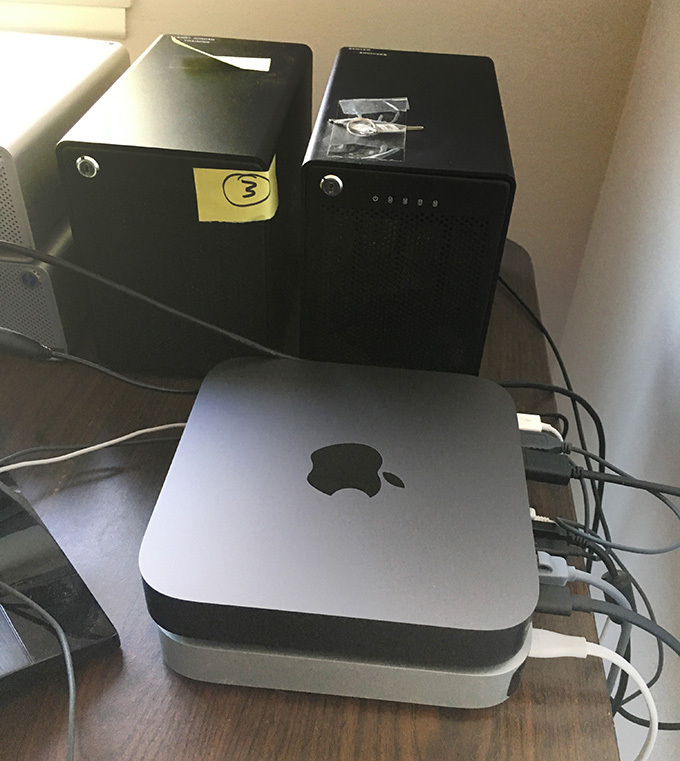 The Mac mini is unparalleled as a stand-alone server for small workgroups both in terms of price and performance. Scanning system. My wife has inherited a scanning project consisting of thousands of photographs, century-old books and slides. The Mac mini is ideal for this kind of documentary and document production. Media Asset Management server. This is a great machine for tracking and organizing media clips stored on servers or locally attached hard drives. General business computer. This is self-evident, but needs to be mentioned. All-in-all, I’m impressed with this new computer. It isn’t perfect, it does need more GPU options, but it is the same size as its parents and packs a whole lot more capability into the same functional package. And… it has ports! As always, let me know your opinions. This Mini with an eGPU will scream. I’m considering one with an eGPU since I already have an Apple (LG)TB3 5K monitor, keyboard and trackpad. Very useful information once again, Larry. Some people need faster renders, others can live without them. And thank you for doing the research many of us don’t have the resources for. I’d like to make a comment about the ports and external drives. I ordered my Mac Mini with TWO thunderbolt 3 to thunderbolt 2 adapters plus one thunderbolt 3 to USB adapter. BECAUSE my current Mac Mini has thunderbolt 2 ports. I used one TB3 > TB2 connecting it directly to my previous Mac Mini booted into TARGET Mode. I used the other TB3 > TB2 and connected it to my TB2 > Firewire 800 adapter. Into that I daisy chained my 4TB Raid 1 drive plus my 1TB Raid 1 drive plus my LG Blueray DVD drive, and into that I plugged in my Firewire 800 to Firewire 400 adapter and plugged my FireWave surround sound audio out box. The TB3 > USB adapter goes to ONE external storage dock and my other external storage dock goes to one of the Mac Mini USB ports. The other Mac mini USB port gets my USB 3 HUB, what connects to my iPhone and iPad and a TomTom GPS. Guess what! Not one problem. FCP X hummms. Oh, and there is still ONE TB3 port open!!! Nice trick! Thanks for sharing. I wonder if the FW800-to-FW400 adapter and sound card won’t slow down the entire FW chain with RAID and DVD player? Have you measured the read/write speeds of the RAID with and without the FW400 sound card? If it is affected, then you have that extra port on the Mini to try using for the sound card. I moved away from FireWire 400 a long time ago. However, if the FireWire 800 RAID is upstream of the sound card it will run at FW800 speeds. If it is downstream, it will run at FW400 speeds. However, even at maximum data transfer, FW800 only has a bandwidth of 85 MB/second. This is way slower than a single hard drive which, today, runs around 150 MB/second. There’s no reason – aside from more storage capacity – to connect a RAID using FireWire. And a DVD player requires about 1 MB/second of bandwidth. I am now in week two running on the new Mac Mini with Premiere Pro. Adobe no longer supports my 2009 MacPro (El Cap). 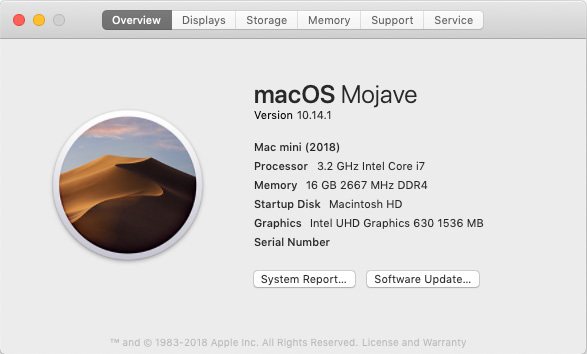 Moving up to the Mini, acquiring Mojave’s incredible speed, I am now on an editing system far more powerful than the nine-year old quad core. I’ve been following Larry’s reports, and I can verify that this is the little engine that could. My work does not go beyond 1k editing. Adobe CC works well with the intel GPU (Metal power) without skipping frames. I have the 3.2 GHz Intel Core i7 chip, and I installed 32GB memory cards from OWC (takes about an hour). Adding a second monitor via CalDigit’s TS3+ Dock is easy. Being a refugee from the lost land of El Cap, I tip my hat to the new Mac Mini. Thanks Larry. Thanks for the report – excellent news! How do you think it will handle 4k video (8bit or 10bit) with some titles, some color correction and maybe a few transitions? I don’t care about the export time but the timeline fluidity. Color correction is heavily dependent upon the GPU. On the other hand, if all you want is timeline fluidity, using proxy media for your editing will solve that problem. It all depends…. If I’m deadline driven and MUST use native 4K 10-bit media, either invest in an eGPU or an iMac with a high-end GPU. If all I need is a smooth timeline, use proxies. If I’m not under a tight deadline, and can afford to wait a bit for exports, the high-end Mac mini will be fine. Keep in mind that as soon as you move to 4K media, you will also need high-speed external storage. In a way I kind of like the concept of don’t pay for a GPU you may not need someday and just go external from the start. If the mini did include a GPU option it would likely get old and users would eventually want a better GPU. By not including a GPU option Apple is not forcing us to pay for a GPU we may never use and just use those savings to invest in the GPU we really want. A GPU we can sell/replace to continue to update in the future the same as desktop PC users. On a laptop a dedicated GPU is critical because that MBP may not always be near a eGPU. With a desktop however if I have a eGPU there is no way I would ever go back to the internal GPU. That would make paying for a RX560 type GPU that the mini would likely be limited to internally a waste of money. There is also the added benefit that GPUs generate heat in a small computer that already needs to handle the heat from the 6 core CPU and moving the GPU external gives the CPUs that much more room to generate heat. Let the eGPU enclosure deal with the GPU heat instead of the Mac mini enclosure. After effects renders rely primarily on processor speed not GPU. GPU tends to be more for 3D oriented applications and plugins.